There are some interesting things happening with sea urchins along the California coast over the last few years. Some areas of central California that have only had modest populations of urchins now have carpets of them across the bottom, and further south, there have been large urchins die-offs. Marine life in coastal areas sure is an interesting ecosystem indicator. I took this photograph in a tide pool in the Point Lobos State Natural Reserve. 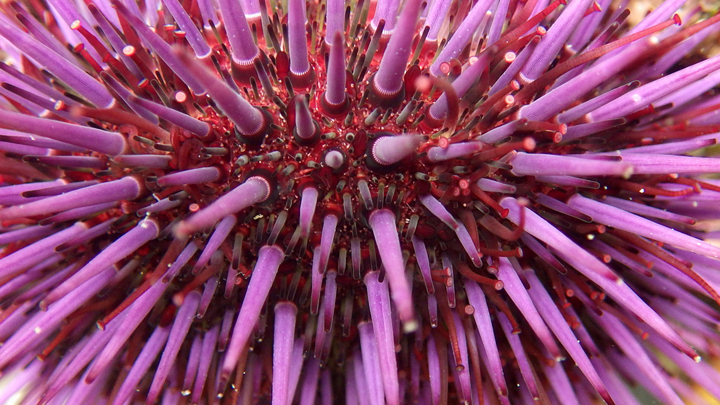 I think the colors and textures of the urchin spines are awesome. They are quite interesting little creatures. What a beautiful, clear photograph!! Amazing color and texture. It’s definitely fascinating to see an area with so many urchins have none the next time we visit.